Scott Cochrane is President and CEO of Cochrane Supply & Engineering, a leading industrial IoT and building controls suppliers with locations throughout Michigan, Ohio, and Kentucky, as well as President of Canada Controls. In 2000, Scott took over the business from his father, Donald Cochrane, Sr., who founded the company 50 years ago. He is proud to be an advisory council member for multiple industry manufacturers such as Honeywell, Johnson Controls, and Tridium, and to be named a 2016 IBcon Digital Impact Award Winner for his innovative contributions to the industry. David Crosley is General Manager of Waibel Energy Systems. Dave has been in the HVAC industry for more than 30 years, with technical experience in large industrial chiller plants, building automation and energy management. Founded as Dayton Trane in 1989, Waibel Energy Systems, and their network of partners through their BuildingLogix distribution network specializes in Mechanical, Building Automation, and Energy Saving services, equipment, solutions, and training throughout the United States and Canada. They make sure all systems communicate properly, coordinate all project participants, collaborate with building owners to ensure systems information will be accessible and usable, and they develop software layers responsible for integration, aggregation, and communication of the building systems. Scott Cochrane of Cochrane Supply & Engineering has the unique benefit of working with 300+ of the best systems integrators in the country. Cochrane recognizes the critical role they have within the building automation industry and is speaking with a different highly-regarded MSI each month with the goal of providing examples of industry trends, best business practices, and the growing value of an MSI. This month, he interviews David Crosley, General Manager, Waibel Energy Systems. November Interview with Derek Drayer of RoviSys. October Interview with Preston Blackwell of Enervise. September Interview with Tom Davis of ERMCO, Inc.
June Interview with Marc Dugré, President of Regulvar, Inc.
February Interview with Jeff Murphy, President and CEO of ECT Services, Inc.
January 18 Interview with Chris Saltz, Managing Principal of FIX Consulting LLC. 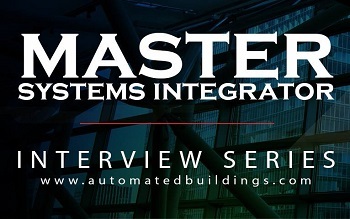 December Interview with Jason Houck from Hepta Control Systems. October Interview with Brian Oswald, Managing Director for CBRE | ESI. This month (December/18) he interviews David Crosley, General Manager of Waibel Energy Systems. Cochrane: How did you become an MSI? Crosley: Our first MSI job came in on a fax machine. It was a school district that was in the early stages of a major construction project of nine new buildings. They challenged us to tie the systems in their existing schools together with the new buildings being built. The building projects although being managed by one construction Management Company was being bid in phases by multiple HVAC equipment Vendors and Control Contractors. We presented the concept of the MSI, where for a percentage of each project, we would do all of the integration graphics and put up the front end for them. They were asking, well how much does that cost? We said it’s about 20% of the control project. So we got POs whenever control projects came in, for 20% of the project price. Cochrane: Can you explain what some of the characteristics are of a good MSI? Crosley: Calm. Extremely good looking and athletic. But really, you have to have a diverse team with knowledge of different vendors, different products, and different technologies. And you need good project management. Cochrane: How do you sell Master Systems Integration services? Crosley: I would say a lot of them are design-build projects going in, where school districts or companies have multiple vendors and control contractors that they have worked with and are frustrated by, for various reasons. Clients want to be able to pull their systems all together so they can be fully utilized and managed instead of being locked down and seen as a mystery to them. We then really work with folks on what we call performance service agreements together. So we’re doing it over a period of time so that instead of doing it as a project, we provide it as a managed service. Cochrane: How do your customers procure MSI services? Crosley: Being an MSI is a more of a service than a project. They buy it from us like a typical service agreement. So in other words, over a period of several years, we manage their systems, and the goal is to leave them with the latest and greatest hardware and software versions/revisions that we can by the end of the agreement. We cover everything, do full maintenance, manage it and replace it just in time before failure so that way at the end of the contract they are in good shape. Hopefully, by delivering true value, we can roll into another Multi Service agreement. Cochrane: As an MSI, what percent of your time is spent in the following categories? R&D, Consultations, Field Commissioning, and Software Programming. R&D: This side is pretty small these days. It’s gotten less and less over the years. What used to take 25% of our time takes 5% of our time now when it comes to R&D now that we have an extensive portfolio and years of experience. Consultation: I’d say 15%-20% of the time if that. Cochrane: Describe a few challenges that you’ve encountered as an MSI. Crosley: Our biggest challenges are time and money as well as resources. In the beginning, it was an uphill battle getting people to accept it, but I think it’s more than just accepting of it when it comes to this concept, it’s expected now. It’s expected that you can handle the different systems. It’s kind of a like a cell phone. People need phones on them 24 hours a day and you better not take it away, it’s expected. If you’re going to be in my building, you better be able to handle all these things. And I think that’s the shift from the facility manager mentality to the IT manager mentality. Cochrane: Do you envision Master Systems Integration being a part of your business in the future? If so, how? Crosley: I see more opportunity for the managed services piece of it than just the projects. People are less interested in buying product and more interested in buying the service, the subscription-based model type of thing. They want be taken care of. They don’t really care about what JACE version they have, what controller they have or what brand or anything like that, they just want to make sure that in five years they aren’t going to get stuck with a hardware or software that they spent a ton of capital dollars on.